Milan sightseeing includes fabulous architecture, world-class shopping, historic basilicas, plenty of museums, and wonderful outdoor spaces and parks. 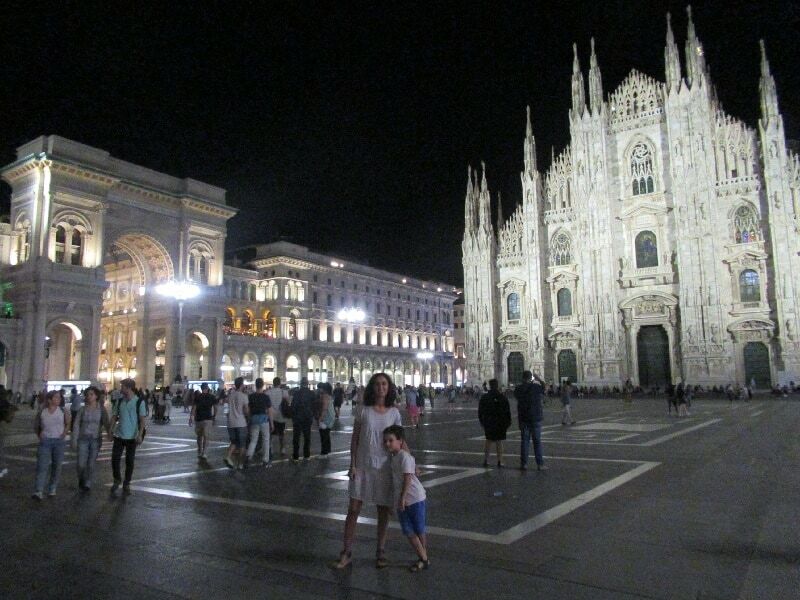 Milan is a chic, cosmopolitan city located in Northern Italy’s Lombardy region. Milan is mostly celebrated for its style. It is home to many of Italy’s world-famous fashion brands and it’s one of the fashion capitals of the world. The Quadrilatero della Moda is a high-class shopping area located in the center around the Montenapoleone neighborhood that boasts innumerable boutiques where you’ll find contemporary jewelry, decor, and the most sought-out Italian fashion labels. As a result of the fashion industry Milan is also home to publishing and media companies. In addition to its fashion weeks Milan also hosts the Salone del Mobile furniture fair. Although not as popular an Italy vacation destination as Rome, Florence, and Venice, Milan offers those who visit a subtle Italian experience uncovered with time. Scratch its surface and you’ll find a wealth of world-class art, architecture, and design. Among Milan’s many sightseeing highlights are its majestic Duomo, the elegant La Scala opera theater, strolling around its many neighborhoods, seeing Leonardo DaVinci’s Last Supper fresco, and visiting the Brera Museum. Visitors to Milan will love its fine food. 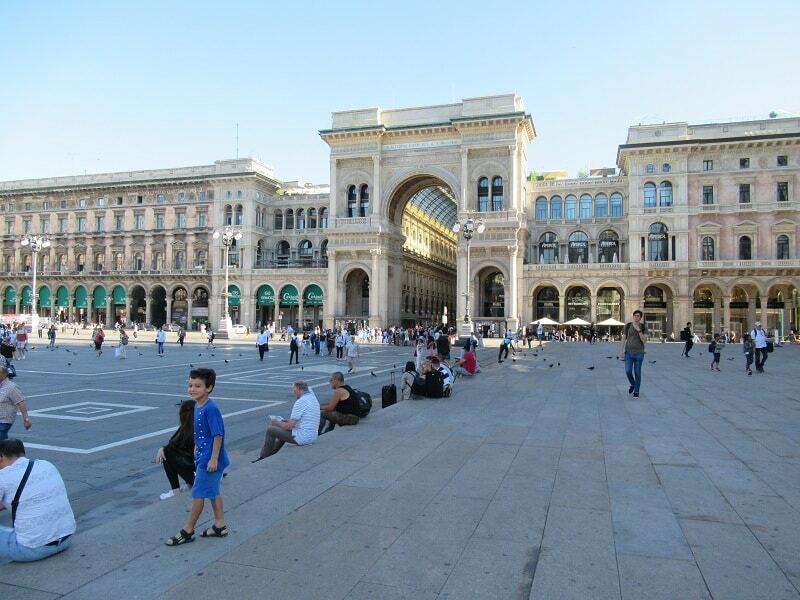 There are plenty of ways to spend a day or two in Milan sightseeing. Read on for Milan sightseeing ideas. Traveling around Milan is easy. There is an excellent underground subway system and above ground there are plenty of taxi, bus, and street train i.e tram system. The public system is known as ATM – Azienda Trasporti Milanesi. Don’t let the ATM signs fool you into thinking you can take money where you see these signs! There are five metro lines. It costs €1.50 for a single ride. The lines are color coded on the map and named M1, M2, M3, M4, M5. Most tourists spend time around the city center where the Duomo is located. The Duomo is served by the M1 red line and M3 yellow line, located where the two lines cross in the center of the map. Click to download Milan subway map. Click to download Milan transportation network map. The Duomo is the most important architectural Milan sightseeing highlight. Its Gothic spires are even more impressive in person. We suggest visiting the Duomo early in the morning. If you arrive later than 9AM be ready to wait in lines. The best idea is to buy your ticket online and then plan to arrive at the Duomo at about 8AM so you’ll be greeted by pigeons rather the throngs of tourists. You’ll get right into the Duomo and have plenty of space to enjoy the interior. Below the Duomo is an archaeology site you may also visit. After you visit the interior you can visit the roof, which opens at 9AM. You can walk up the stairs or when buying your Duomo ticket for an extra 3 euro you can elect to take the elevator. Once on the roof you’ll have a fantastic view over Milan. The Duomo rooftop also brings you closer to its towering spires and gargoyles that leap off the building. The neighborhood around the Duomo in the center of Milan is known as the Quadrilatero della Moda. The Galleria located right next to the Duomo is one of the world’s oldest malls. In addition to shopping there are a few terraces where you can enjoy a bite or drink overlooking the Duomo. After visiting the Duomo you can walk behind it down the Corso Vittorio Emanuele II. There is plenty of shopping here and an overall people-watching scene make it a pleasurable passeggiata. At the Piazza Babila take a left and another left on Corso Monforte, walk one block to Via Monte Napoleone. Take a right on Via Montenapoleone and enjoy some of the best shopping in the world. Here you’ll find flagship stores of the finest made in Italy brands including Armani, Baldinini, Fendi, Ferragamo, Gucci, Prada, Tods, Valentino, Versace, Zegna. This is the center of high fashion and where you’ll find the beautiful people enjoying a day of shopping in the center of Milan. Other streets here where the finest shopping may be found include Via Alessandro Manzoni, Via della Spiga and Corso Venezia. These four streets are why the area is referred to as the fashion quadrilateral or even the golden quadrilateral. At this point if you arrived to the Duomo early your ready for an espresso or maybe even a snack. 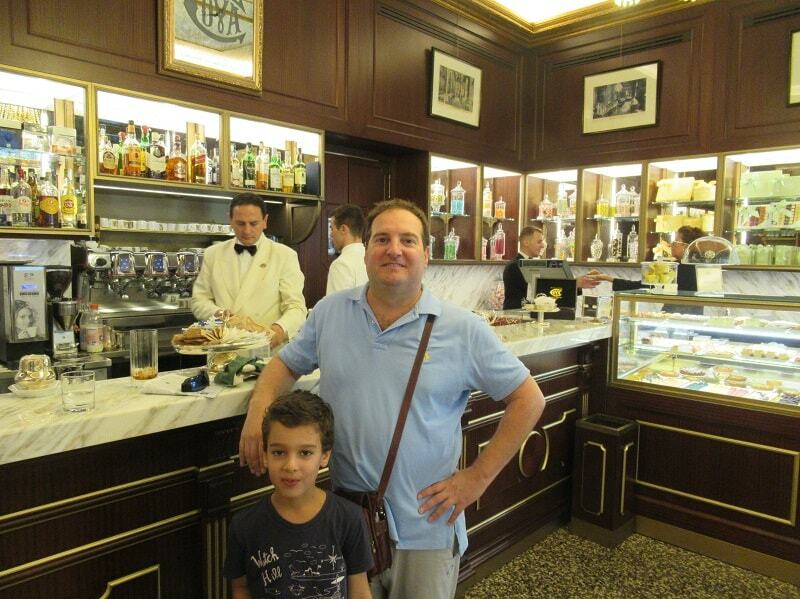 You can jump into Pasticceria Cova on Monte Napoleone for a taste of old world sophistication. I like to stand at the impressive bar for a quick espresso. You may also be seated. Try a delicious cake from the pastry counter, whilst the tea room offers a space of relaxation and comfort, with velvet-covered banquette seating. Cova is located where Via Monte Napoleone crosses Via Sant’Andrea, another fashionable road at the heart of the city. These are the venues that made Milan the queen of style, giving life to the famous Fashion District. Here, where luxury meets design and craftsmanship meets the quest for beauty, Cova has been the most coveted locale for a most exquisite, stylish crowd. Maio Restaurant, Piazza Duomo – go a drink and the view. Skip the food. 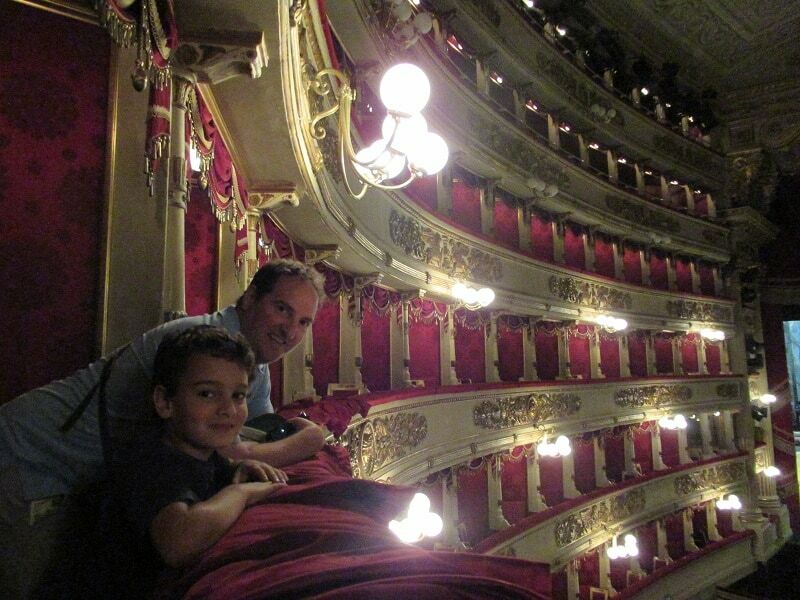 Another Milan sightseeing highlight right next to the Duomo is the Teatro alla Scala, otherwise known as La Scala opera house. Now over 200 years old, having been established in 1778, it is known as the leading opera and ballet theaters in the world and is home to the La Scala Theatre Chorus, La Scala Theatre Ballet and La Scala Theatre Orchestra. For those who love opera and classical music the opera house is a must visit. Even if you can’t see a show, there is a museum you may visit. The museum includes antique instruments and some exhibits about the history of the theater. The museum entrance includes access to a few boxes inside the theater so you can see its beauty. 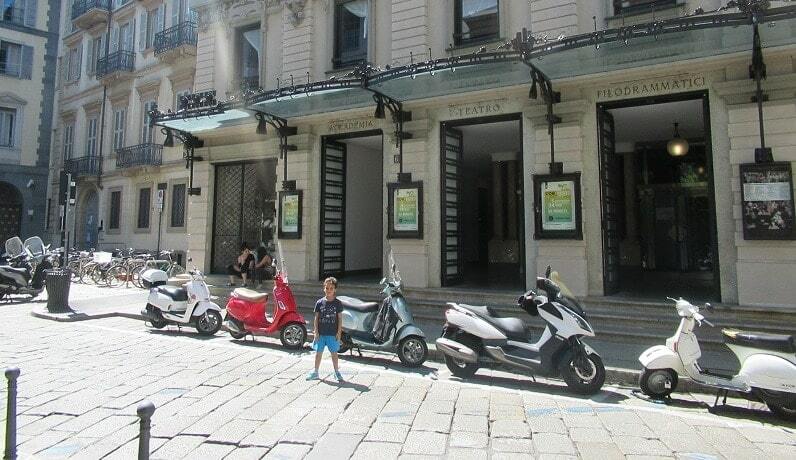 After La Scala pickup the Via Giuseppe Verdi and walk headed away from the center. After a block it changes to Via Brera. This classic Milan street leads to the Pinacoteca Brera, an art museum with Medieval and Renaissance art, primary from Northern Italy. The museum is located the Palazzo Brera, home to other cultural institutions such as the Brera Library, the Astronomic Observatory, the Botanical Garden, the Lombard Institute for Science and Art and the Academy of Fine Arts. The Pinacoteca di Brera’s collection of works of art includes several of the greatest masterpieces in the history of art anywhere in the world. Art historians consider Mantegna’s Dead Christ painting in Milan’s Pinacoteca di Brera his most extraordinary painting. Mantegna used extreme perspective. In this work you’ll notice the use of perspective immediately. Although not foreign looking to us, the shortened image of Christ is very unusual. Mantegna uses odd perspective to draw us in to the suffering on Christ’s face. The distortion is odd as we look at the painting from feet to face. There is also a feeling that the feet are on the peripheral. This is totally divorced from previous depictions of the Medieval dead Christ. This painting demonstrates Mantegna’s sculptural painting style. The stony Christ figure shows the fundamental sculptural approach to painting. It is unclear if Mantegna was commissioned by a patron for this painting. Or, maybe he painted it for his personal collection. Therefore, it is hard to dig into why he would have painted the Christ crucifixion like this. It is an extraordinary masterpiece for its time. The work opens many more questions about the period and the changes in art style and depictions of images. 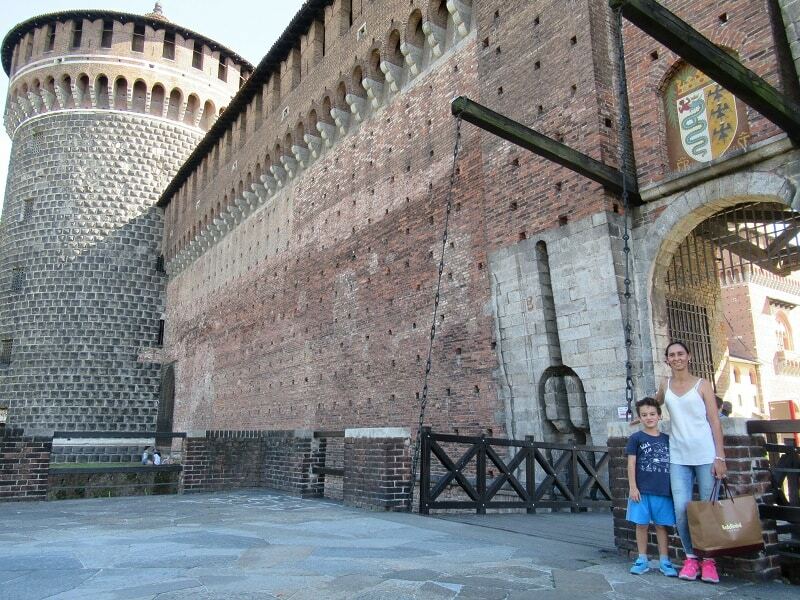 The Sforza Castle is located in Milan’s historic center. There is a large park behind it where the locals enjoy their leisure time on weekends jogging, playing soccer, laying out, strolling and enjoying the day. Inside the castle there are a few different museums, including one that consists of Egyptian artifacts. You’ll also find famous works of art including Michelangelo’s last sculpture, the Rondanini Pietà. It is an unfinished work of art. To visit this sculpture we suggest buying tickets online. Then you’ll need to arrive early in the morning to avoid the long lines. Il Politico, Piazza Castello 5 – fast food Italian style sandwiches. On the refectory wall of the Santa Maria delle Grazie Dominican monastery Leonardo Da Vinci painted the Last Supper. Da Vinci painted it between 1494 and 1498. In the same room Giovanni Donato da Montorfano painted in 1495 another famous work of art, The Crucifixion. The Last Supper represents the moment that Jesus states that , “…one of you will betray me,” rather than typical subject matter when Jesus identified Judas the betrayer. Da Vinci captures the apostles who are there at the Last Supper at the moment when Jesus delivered this announcement. Da Vinci paints the emotions and gestures of the apostles. By exploring this moment it allows Da Vinci to depict gesture and posture of his subjects, which he was famous. When visitors enter the room they will notice that Da Vinci’s use of perspective makes them feel like they are part of the scene. Da Vinci did not use traditional fresco technique painting on damp plaster. Instead Da Vinci used a dry technique. This allows for better light effects and shading and blending tones. As a result this painting is more fragile than traditional fresco, in which the paint becomes part of the plaster and embedded in the wall. The dry technique let to the painting starting to deteriorate immediately after its completion. An atmospheric room protects the priceless work of art, allowing 20 minutes per group of visitors. It goes through periodic restorations, and through modern techniques the very bright portions survived from the original paintwork. For official tickets to the Last Supper click here. Official tickets do sell out early. If you would like to include a tour of the Milan city center with skip the line tickets to The Last Supper click here. Known for its design factories, nightlife, and canals, this neighborhood extends out from the center of Milan on the Corso di Porta Ticinese. The Basilica of San Lorenzo is a 4th-century early Christian church. Inside there are ancient mosaics from the Roman times. 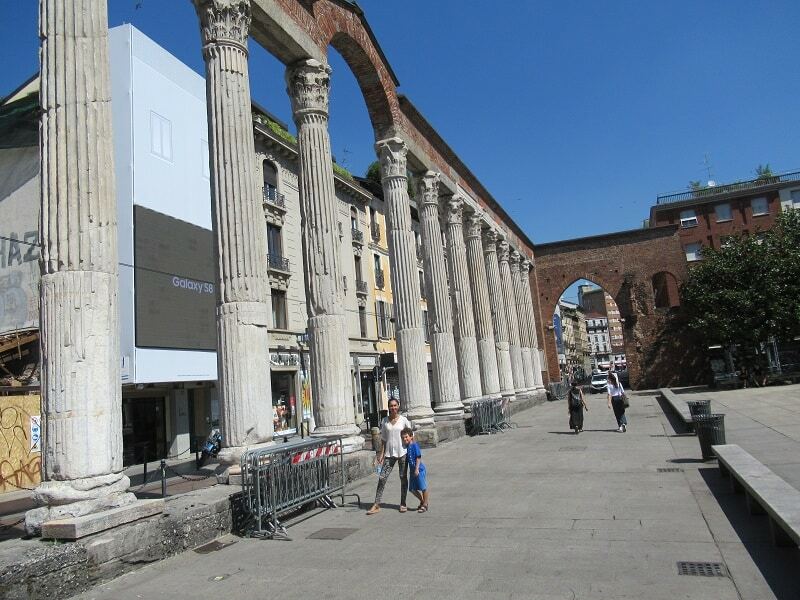 And in front of the Basilica on the Via Ticinese are 16 Corinthian columns, know as the Colonne di San Lorenzo, which also date back to the 3rd-century. Heading further out from the center through the Porta Ticinese are the canals that the Navigli neighborhood is known. Along the canals are bars and restaurants known to be a lively part of town. Traditional Milan neighborhood. Corso di Porta Romana is the modern name of the ancient roman Via Aemilia and is the oldest road in Milan. There is an ancient Roman arch there – the Porta Romana. Near Porta Romana you’ll find bars and restaurants. Viale Montenero is one of main places where you’ll find the night life. In Porta Venezia, part of the Centro Storico area, chain stores fill neoclassical buildings on the main shopping street, Corso Buenos Aires. Nearby, kids enjoy play areas and mini-train rides in the Giardini Pubblici Indro Montanelli, a large park that’s also home to the Natural History Museum with its collection of fossils and minerals. The Galleria d’Arte Moderna displays European art in an 18th-century palace. For more about sightseeing in Milan and nearby Lake Como click to watch the video below. For more about Milan sightseeing and excursions from Milan check out the Lombardy sightseeing page.